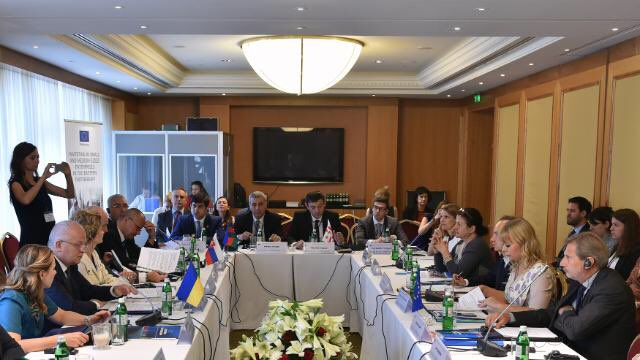 On 11 July, on behalf of the EaP CSF, Steering Committee member Iurii Vdovenko addressed security challenges following the Warsaw NATO summit, the Brexit vote, and the release of the EU Global Security Strategy, as well as development of SMEs and trade at the 7th Informal Ministerial Eastern Partnership Dialogue in Kyiv. The EaP CSF representative noted that a roadmap for cooperation with a membership perspective for Ukraine, Georgia and Moldova would be in the interest of NATO itself. Mr Vdovenko also stressed the significance of strengthening the SME sector that would empower citizens to contribute to reforms in the EaP countries. With respect to country-specific issues, Mr Vdovenko pointed out that the negotiations in Armenia and Azerbaijan for the new framework agreement with the EU should be based on transparency and inclusion of the civil society. Moreover, he underlined the importance of completing the visa-liberalisation process for Georgia and Ukraine. He also noted that, bearing in mind the upcoming elections and challenging reform process, the EU needs to support the progress already achieved in the two countries. Mr Vdovenko expressed concerns over the current state of the implementation of the Roadmap for Higher Education Reform Implementation in Belarus and pointed out that more attention should be paid to the issues concerning human rights, human rights defenders, as well as working conditions of civil society in Moldova.